Last Minute Thanksgiving & November Deal! Lowest price ever! Our villa, Tree House, is beautifully decorated and furnished with attractive, upscale furniture, brand new bedding and many upgrades. Located just 3 miles from Disney's main entrance in the peaceful Indian Creek community, Our Tree House provides a superior accommodation in the ideal location. 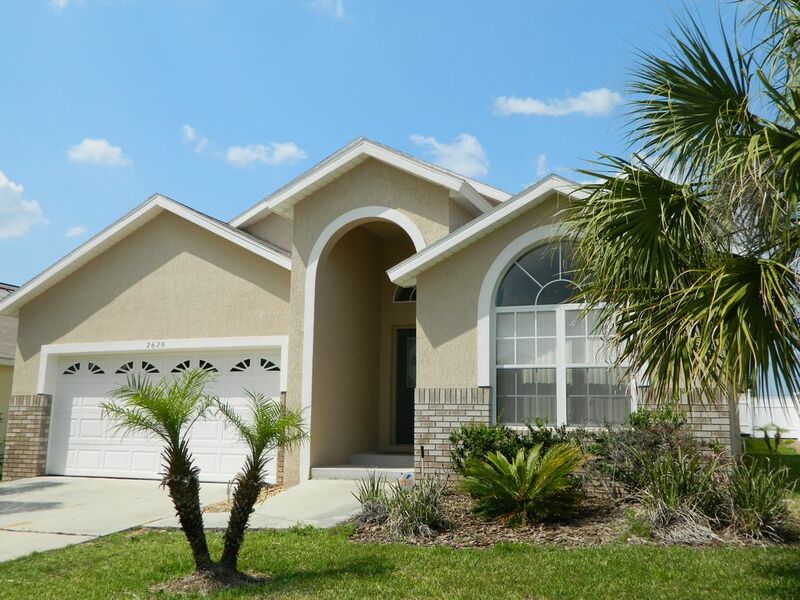 This area is known as the preferred area for guest home rentals near Disney because of its close proximity to other attractions including Universal Studio, Sea World, Discovery Cove, and Wet 'N Wild. There is a large plaza comprised of nearly a dozen restaurants, various shops and a 24 hour grocery store located on the corner as you turn off of Rt. 192 to head back to your home. This stylish single story 5 bedroom/4 bathroom home has air conditioning, heating and ceiling fans located in every room. The two king en-suites open to the pool area and have luxurious pillow-top beds. A third Queen-Size bedroom has a pillow-top bed and adjoining bath. The remaining 2 bedrooms each contain two twin beds. There are plush linens throughout. The couches in the living room open into queen sofa bed, if needed, or can just be used to lounge on as you watch late night movies on the nearby cable TV. We have cable TV and ceiling fan on each bedroom. We also provide FREE high speed Internet service and FREE domestic long distance phone service. Keep in touch with anyone, anywhere in USA, all you need to do is hock up your laptop and sign on. The sparkling pool is the perfect place to enjoy the Florida sunshine. The pool/Spa is gas heated with lighting so that you and your family can enjoy splashing around whatever time of year or time of day you come to stay. The BBQ Gas Grill in the patio is provided for your convenience at no additional cost. The large, fully equipped kitchen offers everything you need to feel at home: a dishwasher, microwave, coffee maker, toaster, blender, cookware, plates, glasses and silverware, etc. There is a well-equipped laundry room with a washer and dryer for your use, complete with an ironing board and iron. Extra Thick and Fluffy Towels are in all bathrooms. Provided at no additional charge is gear for the growing family: a Pack-n-Play portable crib, high chair, stroller, and bed rails. If you step outside, there's plenty to do in Indian Creek, with tennis courts, putting green, BBQ and Picnic areas, plus a volleyball court and child's play area, and easy access to the parks. You have a perfect vacation base. Our Tree House can truly be your home away from home. Please note, our home is non-smoking and we are unable to accommodate pets. Dishes, spoons, folks and knifes, cups etc. Dinning table with 6 chairs. 9) the kitchen knifes were in bad condition and not sharp, one of our party cut their finger because of a damaged knife. 10) the blinds in the front bedroom were insufficient and needed to close out large open glass space. 3) clearly define the recycle bin pick up day and clarify the uses of the three (3) garbage bins in the rule book. 4) review your checkout time of 10:00 am because it is impractical to start the laundry of so many bed clothes prior to departure. We had to get up early to ensure compliance. Overall we enjoyed our stay at the house, however we used the house mostly to relax in the evening/night after visiting all the parks attractions and amenities during the day/evening. Thank you for your review. I just come back from the house. Have fixed what I can during my two weeks stay. Purchased new pillows, new comforters and bed sheets for every beds. Also new towels for every bathroom. Cable tv was working for all rooms. I have standard service from spectrum. If you ever see tv is not working, please contact our local management staff. If it is issue with cable, they can contact customer service for you. For the garbage collection: Thursday is yard waste. Monday is regular garbage collect, when you checkin, it is Saturday, half load in the bin needs to wait coming Monday to collect. Wish you could be polite when asking for help. Especially for something is not a part of their job. We had a wonderful stay at this home. It was incredibly spacious and well equipped. There wasn’t as much sun in the pool area as we would have liked, but we had paid for the pool heating, so it was wonderfully warm. The home is roomy, the beds had some memory foam pads on them so for a week they were acceptable. The refrigerator worked, however, ice maker did not and the door shelves were all broken as were 2 of the drawers. The oven worked but was no where near the correct temperature. We had to set it at 450 to get any heat. Cooking / baking dishes were extremely poor, the owner did provide new items after contacting the management company. Rugs were torn in areas and runner in front of sliding door curled on the ends making it a trip hazard. The directions referred to a pool cover that was not present, however pool stayed warm. We did not try the jets in the hot tub area as the control wires looked to be in poor shape and we were concerned about possible issues. One bathroom had a fair amount of mold around the window caulking. Light on end table did not work because the switch to turn on/off was missing. Chairs in kitchen area are loose and we had concerns that they could break and lead to a fall for some people. The home advertises 6 televisions and cable tv, what you get is 4 or 5 stations tops. On a positive note, the owner was very easy to work with and polite and responsive to texts. As noted above replacements for severely burned pots and pans were obtained quickly. This could be a very comfortable and pleasant rental if home updates are made. The property is very well located, near shops and supermarkets. The house was in Excelent conditions, very comfortable and with all the necessary devices to make your stay pleasant. Very nice and spacious! Great location! This property is very spacious for large family vacations. It is conveniently located to parks and many other tourist destinations. It is also very near numerous restaurants and stores. I would highly recommend the house. The Indian Creek community facilities include a tennis court, children's playgrounds, a putting green and multi-purpose sports fields, where you also can watch the fireworks on some nights. Close by are miniature golf, movie theaters, grocery stores, pharmacies, water parks, horseback riding, golf courses, parasailing, restaurants, boating, jet skiing and hiking. ---MGM-Studios (5 minutes drive): In Disney's Hollywood Studios, you could take center stage as the star of your own Hollywood adventure: from rock 'n' roll fantasy to Broadway-style stage spectaculars. ---Magic Kingdom (5 minutes drive): At Magic Kingdom Park, you step into a storybook as your dreams come to life in this magical place. ---Epcot Center (5 minutes drive): Epcot celebrates the diverse cultures and wonders of the world. ---Typhoon Lagoon (5 minutes drive): Enjoy the wild waterslides, roaming rivers and wooly waves of Disney’s exhilarating water park adventure. ---Blizzard Beach (5 minutes drive): Take the plunge into an aquatic adventure as you slip, slide and glide through another Disney water park. ---Sea World (15 minutes drive): Sea World takes you on a one-of-a-kind journey to the wonders that exist beyond the ocean's door. It’s a place where up-close encounters connect you to the energy, excitement, and mystery of the sea and sea life. ---Universal Studios (Orlando) (20 minutes drive): Jump into the action of the movies! You're the star at Universal Studios, the number one movie and TV based theme park in the world. At this real film and television studio you'll go behind the scenes, beyond the screen and right into the action of your favorite movies. Shopping at Outlets, Kissimmee Loop and the Florida Mall are all minutes away, March is Spring Training and Kissimmee is summer camp for the Houston Astros and the Atlanta Braves. The Cleveland Indians are 5 hours away in Winter Haven and the Detroit Tigers are 45 minutes away in Lakeland. Catch many of the PGA and LPGA tournaments during the 'Florida Swing. The Daytona 500 is an easy drive about 1 hour away, and the Cape Canaveral and Cocoa Beach are a little over 1 hour drive away. Just on the highway 192, Formosa Gardens Mall has a very well stocked Winn Dixie supermarket and a number of excellent restaurants. There are several great restaurants without even having to go into highway traffic. Some of the great restaurants in the area are Red Lobster, TGI Friday's, Outback Steak House, Giordano’s ' Pizza, Carraba’s Italian Cuisine, Subway, the old country store -- Cracker Barrel and Dairy Queen for ice cream treats. There is also a full service grocery store with a deli, an urgent care facility and a Walgreen's Drug store in the same area. Our broad range of shopping, dining and entertainment options means there’s always something everyone can enjoy. Head west on Hwy 192, this excellent public supermarket is on your right. It’s open 7am to 11pm. With some excellent small shops and a good selection of restaurants, it is the ideal place to take the family for a stroll around the lake, to spend a few moments sitting in the rocking chairs by the water’s edge and to enjoy a good meal. Kissimmee is in Osceola County which has many courses; some of the best are close to our villa. Designed by Champions Tour Player and NBC golf analyst Gary Koch, rated a Four- Star course by Golf Digest magazine and ranked number 2 in 'Orlando's Top 5 Golf Courses'. Designed by Greg Norman. The national is an impressive American style course in the best traditions of modern U.S. golf course design. The International provides the style familiar to those who have played the great old courses of Scotland and Ireland. It boasts the highest course rating in the state of Florida at 76.3. Celebration Golf Club is a Robert Trent Jones designed golf course. The course is rated 4 1/2 Star in Golf Digest and ranked #12 by the Florida Golf News. Century-old oaks, towering cypress trees, a dozen unique water hazards and friendly sand hill cranes provide the backdrop for a first-class golf experience at Kissimmee Bay Country Club. Optional pool heat will be $200/week or $35/day. Rates for Holidays vary. Please contact owner for rate information. Until confirmed, rates are subject to change without notice.